In my last post, I presented the motion-sensitive electronic eyes I designed for a friend’s haunted house. 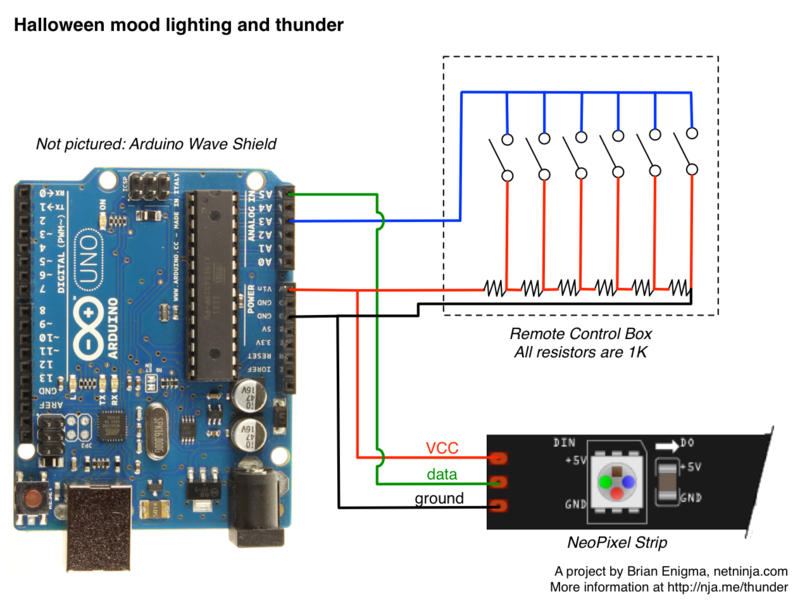 In this post, I will show you the module I built that generates ambient lighting, but also kicks in some surprise thunder and lightning at the push of a hidden foot switch. The device is comprised of two boxes, separated across the room and connected by a four-conductor telephone cable. Next to the entryway is the “brain” box. This is connected to the LED strip above the garage door. 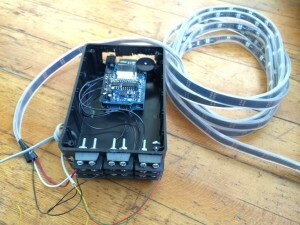 It houses the Arduino and sound generating hardware (Wave Shield). It is also hooked up to a small stereo. On the other side of the room is the “remote control.” This is the box with buttons for picking a set of ambient lighting colors as well as the hidden foot switch. 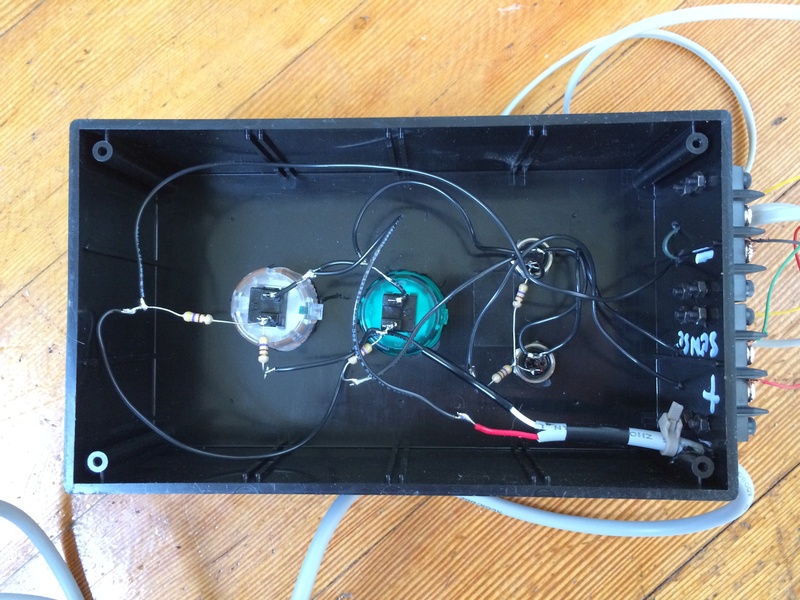 The telephone cable provides power and ground, but also has a “sense” line, hooked up to an analog-to-digital converter on the Arduino. Because of the resistor matrix in the box, each button will return a different voltage back through the sense line. If you have used iPhone or Android headphones with integrated volume and answer buttons, this is the exact same concept but blown out to four buttons and a foot switch. The Resistor Matrix has you, Neo. Mode — This cycles between a few different ambient color programs. Custom — This stops any custom color animation and lets you program a color with red, green, and blue values. The first time you press it, you get a quick flash of red, indicating you will start adjusting the red hue of the light strip. The next time, you’ll get a flash of green and the next, a flash of blue. In this fashion, it lets you cycle between the three primary colors, altering them as desired. Color up/down. When in custom color mode, these adjust the current red/green/blue value. Foot switch. Flashes of lightning on the light strip, timed to prerecorded sounds of thunder on the stereo. Red breathing — slowly cycle between a dim and a brighter red. Two color cat toy mode! Four color cat toy mode! 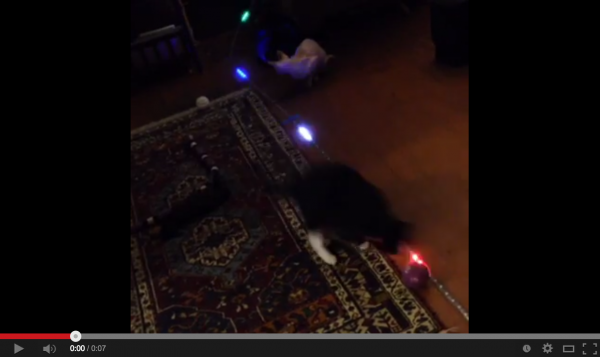 The two cat toy modes are either two colored pixels or four colored pixels that bounce around the LED strip. Those were just me messing around as I fleshed out the hardware design and really have no place in a haunted house. But I couldn’t just get rid of them. More fun than four laser pointers! We got to scare plenty of children on Halloween night. As soon as they stepped into the room, someone would hit the foot switch to get a blast of thunder and lightning. 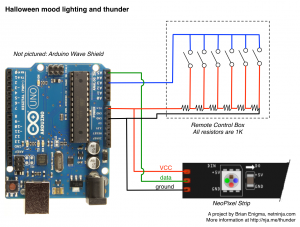 The technical hardware and software details are on the halloween-thunderfx GitHub page.